Takahashi FSQ-106ED @ f/5.0 (530 mm F.L.) Captured at 3.5 arcsec/pixel. Shown resampled to 8.4 arcsec/pixel. Ha, Green & Blue are mapped to RGB respectively. Click here for the narrow band color mapped image. Click here for the B & W Ha filtered image. CCDStack to calibrate, register, normalize, data reject & combine. PhotoShop for color combine & non-linear stretching. 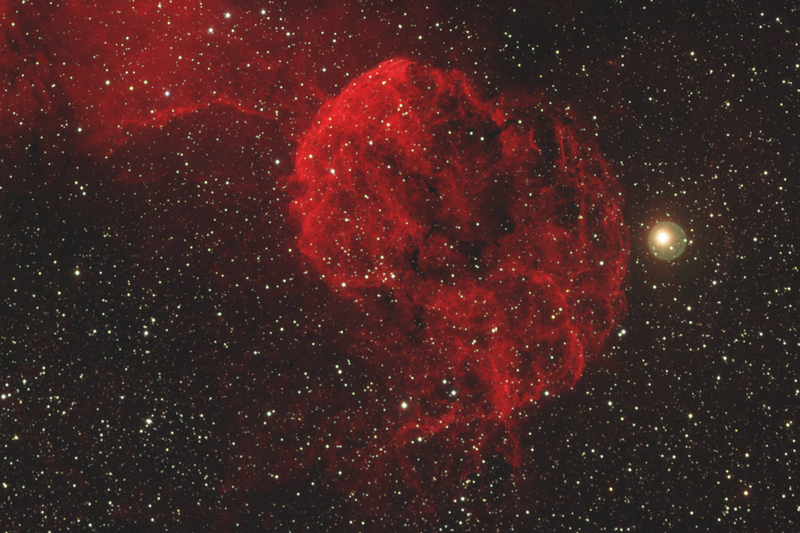 The Jellyfish Nebula is a Galactic supernova remnant, in the constellation Gemini, that occurred 8,000 years ago. It is one of the best studied cases of supernova remnants, interacting with surrounding molecular clouds. IC 443 spans about 65 light-years at an estimated distance of 4900 light-years.